Continuing its efforts, on 5th August 2015, a NOINO delegation led by Shri Prakash Javadekar, Union Minister & President NOINO met Finance Minister Shri Arun Jaitley to break deadlock on wage revision and one more option for pension. The delegation consisted of Shri Ganesh Kamath, Chief Advisor; Shri Dattaraj Prabhukhanolkar, General Secretary; Shri S. K. Saini, EC member & Shri Yashpal Singh, Zonal Secretary, NZ unit. Meeting was essentially an attempt to break the stalemate on the wage revision & the pension option issues. We have expressed emphatically that LIC employees deserve a wage revision that is commensurate with its paying capacity. We firmly expressed our opposition to our linking with the banking industry. 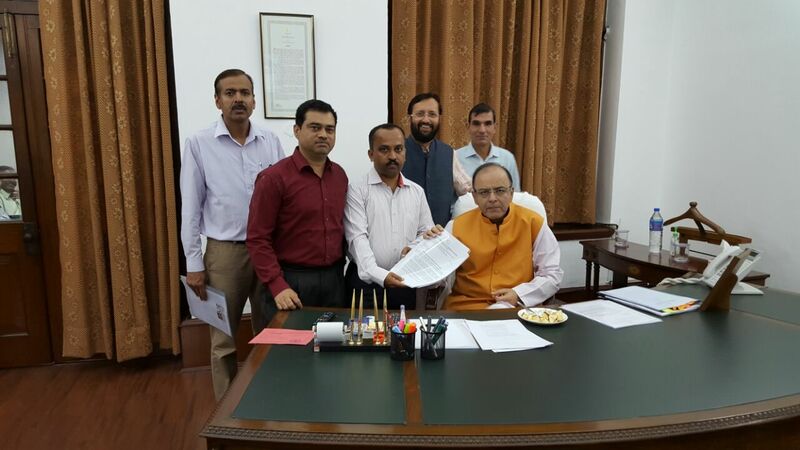 Jaitleyji patiently heard us & assured to look into the matter. The delegation also submitted memorandums on the issues of 5 days' week & anomaly after computer increment. 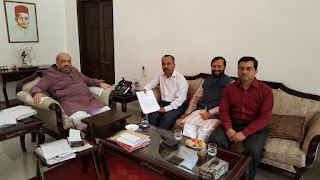 The delegation also met Amitji Shah, President BJP once again (after our meeting on 9th July) as in the previous meeting he had invited us to Delhi for further talks. We once again urged Amitji to ensure the delinking of LIC from the Banking Industry as also to reign in the bureaucrats who were scuttling the just demands of LIC employees. NOINO will continue to make efforts to resolve the pending issues of the LIC employees. We also appeal to all the employees to follow all the agitation programmes given by the joint front.